Some ambitious tech pioneers are already taking steps towards building a new, decentralized web. Ironically, the Summit was held at the old San Francisco Mint — built in 1874 . For example, OmiseGo uses an Ethereum-based blockchain in the pursuit of what they call “financial inclusion and interoperability” via the public, decentralized OMG Network. And MaidSafe has developed the SAFE network, which splits data into pieces so it can’t be traced, “with data stored as encrypted pieces on other people’s devices…” according to its website. Remember this meeting – big things may flow from it. In a presentation later at the summit, HBO’s “Silicon Valley” creator Mike Judge said that MaidSafe was one of the companies they “looked at a lot” when dreaming up the “decentralized web” plotline for the show. The article captures the visions of an online world where we’ve separated our data from our applications, with new ways to authenticate and identify ourselves — all hosted on a decentralized network. “And above all it will need to be easy to use, low latency and simple for developers to create decentralised applications for,” the site enthused. It’s a movement that’s drawing interest from some prominent advocates. Recently an article about the Summit from Bitcoin Magazine was republished last month on Nasdaq.com. It points out that Berners-Lee was scheduled to present SOLID, a new protocol and toolbox under development at MIT. “The SOLID project wants to build decentralized social applications while preserving, as much as possible, compatibility with existing W3C standards and protocols,” the Bitcoin pub noted. Just did a panel with these awesome folks, talking about what it will take to make a new web productive, safe, and fun for everyone. So how do we get there? By making it easy to participate, just like the protocols of the original world-wide web. “Creating common coding standards would allow independent developers to go off and create their own component parts, that can fit together in various ways, like the way Lego pieces can be assembled and reassembled…” Though the FAQ acknowledges that the whole ecosystem “might not be fully functional and integrated for another five or ten years,” everyone is looking to ways that the transition can be smooth. Several of the Summit’s attendees filmed their thoughts on the future of the internet for a time capsule. And apparently, there’s already plans to release a documentary about the Summit. “We are at a critical juncture in the development of the web, at which radical new visions and protocols are fomenting in the face of mounting structural and political crises,” explains a webpage on the Summit’s site. “The DWeb summit is a coming-together of old and new thinkers who will play a crucial role in confronting these challenges and defining the future trajectory of how the internet is imagined and engineered. It’s a sentiment that’s echoed by the Internet Archive’s FAQ. “Remember how it felt to use the early World Wide Web? Apps and features came and went. Some of it was buggy, and some of it was revelatory, and users helped developers figure out what needed to happen, and how it could better come together. The AI that gauges company morale by reading everyone’s emails. The creator of Ruby looks back over the language’s first 25 years. NASA open sources its instructions for building a Mars rover with a Raspberry Pi. That time Steve Jobs got to use an iPhone-like device — in 1994. How cars used automated navigation systems back in the 1930s. 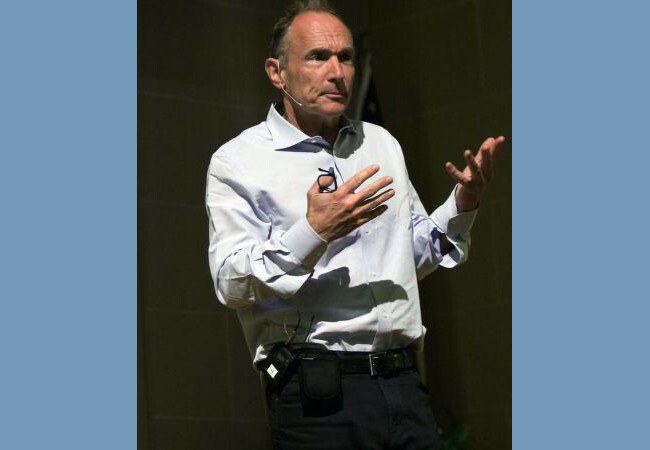 Feature image: Sir Tim Berners-Lee at the 2018 DWeb conference, photo by Brad Shirakawa, Creative Commons license.